I havn't gone completely crazy, but I now (sort of) am the answer to everything. So, now that I am the answer to "the Universe, and Everything" I planned to see the work of a couple of other researchers that also had answers to a lot of questions on a grand scale, like the amazing International Encyclopedia of Unified Science - a fantastic project that of course failed. The main reason for my trip to Vienna was to see some of the graphics by Otto Neurath and his collegues. I recommend having a look at the Isotype archive, or better, the paper Like sailors on the open sea (PDF) about his statistical work. If you are looking for a book about his work, I recommend the short but efficient Principles of Making Isotype Charts, in part written by his wife Marie. It has the best images of the most important works. 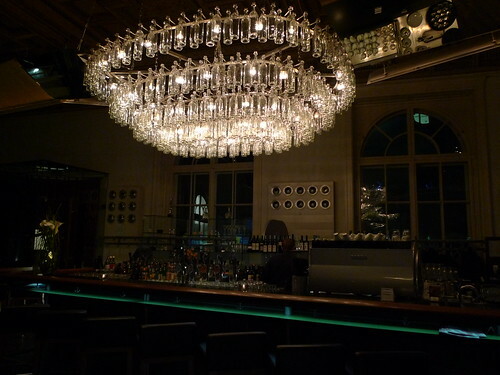 The Österreichisches Museum für angewandte Kunst (MAK) does not allow cameras so I cannot show what the exhibition looked like, but I can just show the Österreicher im MAK restaurant that I found to be the nicest pub in town. Absolutely gorgeous! Coffee. 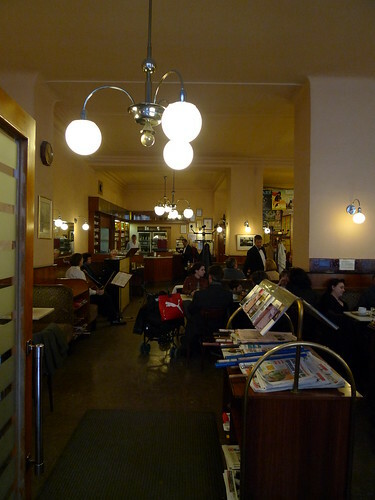 Well, they say the modern café was invented in Vienna. There is a very refined café culture here, meaning there's lots of different styles of coffee, the café is a place to meet people, to sit for a long time (=hours), and to read newspapers (available for free, even international ones). 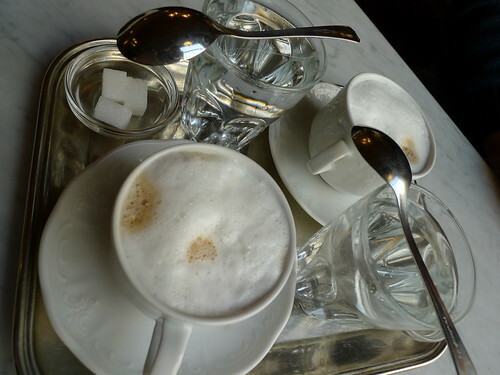 One of the common variants of coffee is Wiener Melange and it looks like the photo below. There are incredibly many coffee variants and some are local (not the typical Italian names). 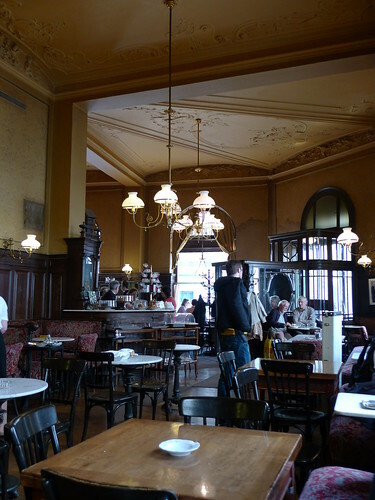 If you can, the german version of this wikipedia page on Viennese café history is pretty much essential reading. The best cafées are not pretty but try to keep the traditional style. Waiters are usually men in black suits, for example. 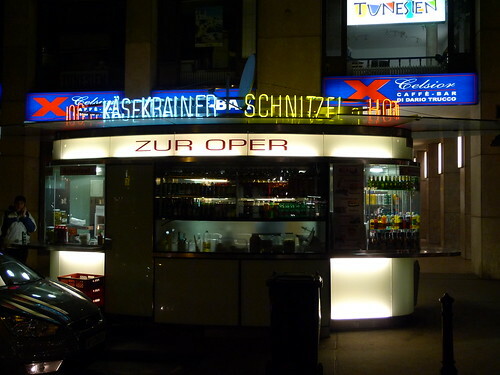 This is what Bräunerhof and Sperl look like. Live classic music is not uncommon on weekends. If coffee is the national hot drink, then Tafelspitz is the national dish of Austria. It is basically boiled beef but again there's an advanced protocol on how to cook this dish and even how to eat it. 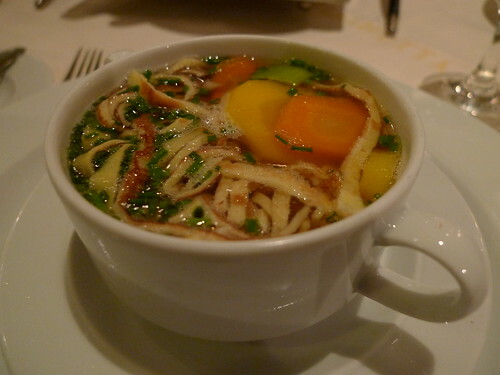 You start by having the broth as a starter soup, the bowl topped with shredded pancakes. Pancakes appear in surprisingly many ways and dishes here. 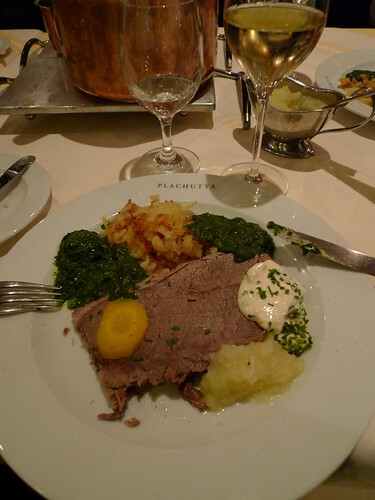 Then you eat the beef (there are confusingly many different cuts of beef to choose from), with Rösti, apples and horseradish sauce. There are of course many more things to be said about Vienna but I'll save that for my next trip when my research is a bit better grounded. But, many museums are worth visiting, especially the MuseumsQuartier and MAK. The Secession building interior is a rip off at €8, for nothing.The CAT (fast train between the airport and the city) is also a rip off, when the S-Bahn is almost as fast and costs almost nothing. The saturday market Naschmarkt is essential; plan for having lunch there at one of the many food places. Learn how to say hello (they are always very polite and friendly here). Don't eat cake with every cup of coffee. Go there in April/May or late fall (warm but not too warm). Drink the local fruit schnapps. Always rent an audio guide at the museums. Buy day passes at the local transport system (subway+tram+bus). 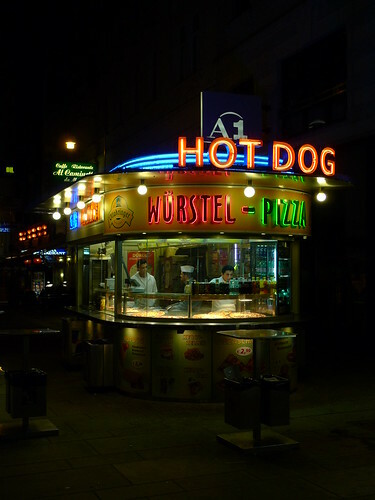 Skip dinner one evening and go for the local street food. Just look at how beautiful the street stands are (click for full size). 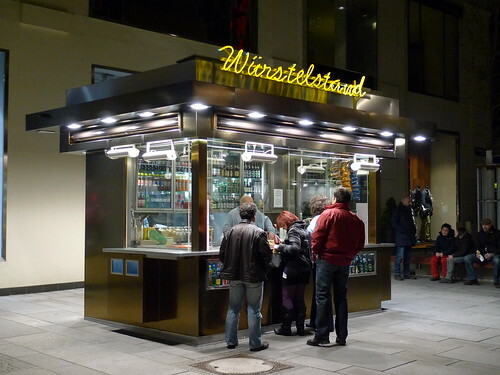 And, yes, schnitzel can be street food here. Content updated 10 March 2019. <URL: http://boralv.se/blog/?id=1269206772>.